The sweat pouring down the back of my neck was partly due to the succession of hills I had climbed while wearing jacket, gloves, and jeans; it was also due to the fact I was biking on a busy two lane country road at night, with cars speeding past and blinding me with their high-beams. For what seemed like an eternity but was in all reality probably no more than 45 minutes, Nick and I biked the distance between Greystones and Bray. Following my transcendental experience walking around the northern terminus of the Dublin mass transit system, I convinced Nick that we should do something similar on the southern end, which happens to be Greystones. We took bikes with us, determined to ride back into town as darkness fell. Never mind the fact that when we arrived in Greystones, 17 km away from home, it was already just about pitch black. Never mind that the road we were to take was packed with cars heading into Dublin for the evening’s entertainment. Never mind that we were overdressed, considering that the road ascended quite steeply between the two towns, and never mind that the road didn’t have a bike lane, let alone much in the way of a sidewalk. You think after the last time I walked a country road at night I would have learned, but out of sheer stupidity or obliviousness to my good fortune at avoiding injury (thus far) I found myself wondering if we would make it back whole. The cold wasn’t really so much an issue; making sure neither of us tripped over a pothole or was struck by the ceaseless rush of passing cars raised the stakes beyond anything reasonable. 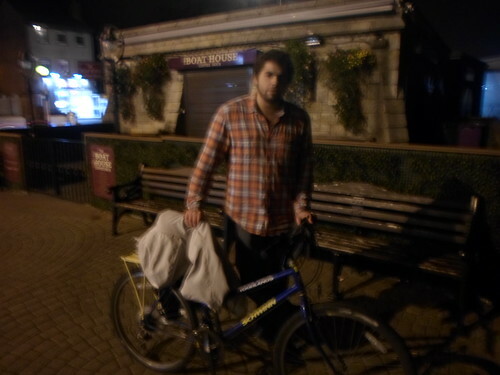 It became clear within a mile or so of biking that there was no way we were going to make it the whole way home, so instead we decided to bike to Bray, the next train station from Greystones. I was cursing my stupidity the whole way there. The universe was merciful and we encountered only one large truck on the road—and this was on a brief portion where there was a separate walkway, so we were safe. Otherwise we would’ve been flattened. When we finally arrived in Bray we were both drenched in sweet-smelling sweat and a bit shaky from the adrenalin that had been coursing through us as we rounded each turn, wondering if a squirrel would dart beneath our tires and send us flying, or if a car would try cutting through the traffic and run us off the road. 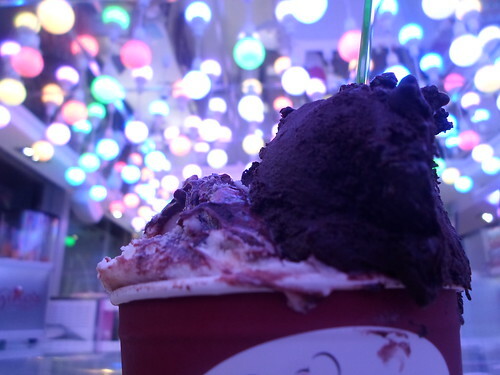 The gleaming lights of a gelato stall beckoned to us like land to a shipwrecked sailor, and we calmed our nerves with tubs of brownies and Nutella gelato. Then we boarded the train back into town, swearing to never do something so reckless again, even with gelato waiting for us at the end of the line. Posted in TransportationTagged Cycling, Dublin, Ireland, nom nom, Nutella, stupidity, travelBookmark the permalink. It was all the walking from France and Spain that did it!